Newly developed, incredibly strong Balanced Action pedal system works perfectly with head tension for smooth operation and precise adjustment. 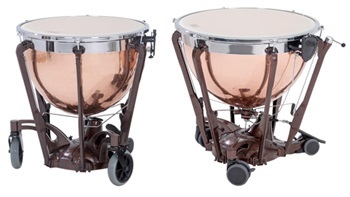 Optional player’s side fine tuner is available for the most precise pitch adjustment available on balanced action timpani. Note: The Gen II Professional fine tuner must be installed at the time of manufacture and is not available as an add-on accessory. Single flanged, chromed steel suspension ring for improved sustain and projection. Large, double-wheel swivel casters are mounted on wide base legs for improved stability, and integrated third wheel allows for safe maneuverability. Tuning gauge, tuning key, and felt mute are included standard. European Style block pedal system, also known as clutch and post, allows for smooth, precise pedal action regardless of head tension. The locking pedal action secures each pitch in place. Timpani Key is used to lock and unlock legs into position. Legs quickly and easily adjust to the player’s height, and retract into the base for easy transport. The leg opposite the player is fitted with a wheel for convenient positioning and movement while setup. 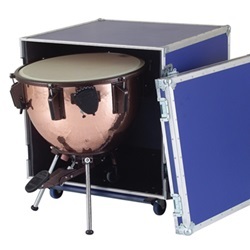 Lightweight and easily transportable, a set of timpani can easily fit into the average car. Soft bags are available to protect the timpani during transport. Head : REMO Renaissance Series.